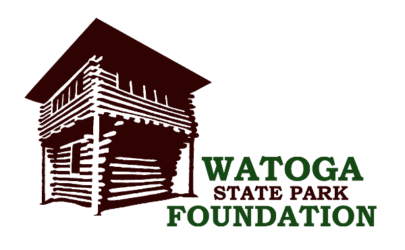 If the Bear Pen Trail is any indication of the current condition of the rest of the trails at Watoga State Park then the trail volunteers are in for a big clean-up task. Cleaning large branches and trees off the section of the trail from the trailhead to just the junction of Buck and Doe took nearly 2 hours. Praise be the person who invented the z-rig. Family Reunion Central. 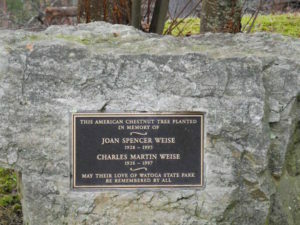 Last week’s “Watoga- Where Is It ?” photograph of the memorial plaque at the T.M. 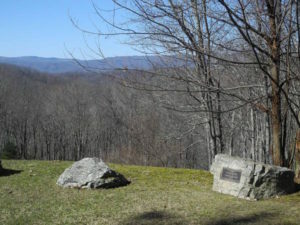 Cheek overlook has a backstory. And I will share it with you. his great grandfather who lived in Renick, WV. Great Grandfather Weise started a grand tradition of annual family reunions at Watoga. These family gatherings continue to this very day as the family has grown through many generations. At one such reunion some years back they filled every cabin in the park. “Our family has been coming to Watoga every year for the Spencer family reunion since 1963. From the late 1960’s at least, our family usually spent the week in Cabin 21. The trail up to TM Cheek from Cabin 21, which was then called the Honeymoon trail, was my parents’ favorite walk. They’d often go up there early in the morning while my brothers and sisters and I were still asleep and look at the view from the overlook. It was still their favorite walk in their later years. My Mom died in 1995 and my Dad in 1997. Thanks to Char Weise and John and Margy Goodwin for this bit of history about a park that just seems to bring forth such wonderful memories. Let us hope that many more generations will be able to experience the joy and beauty of being in West Virginia’s largest and best park.